Among all the things to do in Barcelona, these half and one-day tours to Montserrat Monastery, have our preference. Perhaps it is because the kindness of the guides who will make you discover the historical richness of Catalonia! 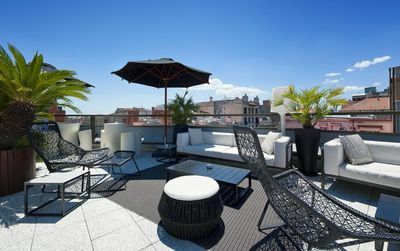 But imagine leaving early in the morning Barcelona centre for a perfectly orchestrated day between visiting the Monastery, the local museum - where you can admire works by Picasso and Dalí - and learning the legend of the Black Madonna. A religious site but in the same time the discovery of breathtaking views of the mountain of Montserrat and of regional products in a local farmer's market. Imagine also a short cable car excursion before taking a gentle stroll through the Penedès vineyards and cellars where you have lunch from local producers before learning to taste the ecological wines of the estate! It's hard to tell you about the smells of undergrowth or the flavors of Penedès and Cava wines in this description, but let Clara, Sandra, Agnès, Lorenzo, Alex… Guide you for this unforgettable day! Choose among these one day or half-day tapas, wines & Montserrat tours, in small groups, with English speaking guide! 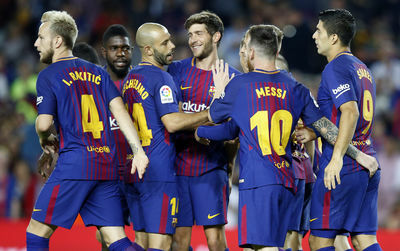 A day tour from Barcelona centre to Montserrat & Gaudí’s crypt, a modernist masterpiece and UNESCO world heritage and the visit the Benedictine abbey Santa Maria, nestled in the spectacular mountain scenery of Montserrat. 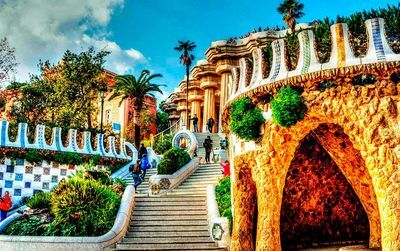 You will learn about the region’s history on a visit to the former industrial colony Güell and its famous crypt, and join us on a tour around the outstanding art-nouveau church by Antoni Gaudí. Enjoy your visit of the site with a glass of sparkling wine and let your tour guide explain the building’s architecture and its similarities to the Sagrada Família. Your trip continues to Montserrat Mountain, a rock formation which rises abruptly from its flat surroundings to 1,236 meters. Enjoy a scenic ride on the rack railway up the mountain and arrive at the monastery, which has played an important role in Catalonia’s cultural and spiritual life for many centuries. 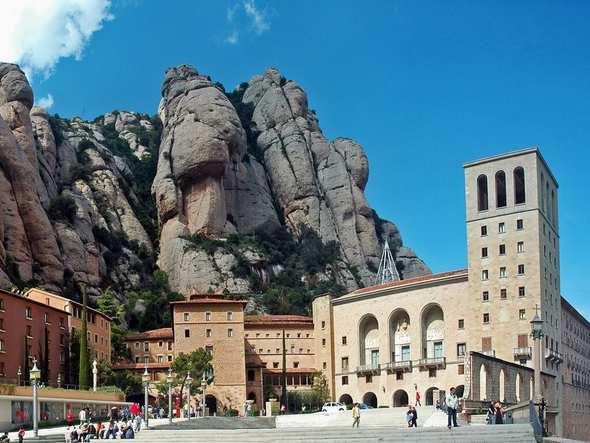 The Benedictine abbey Santa Maria de Montserrat, whose history goes back to the 10th century, is famous for its image of the Virgin of Montserrat (the black virgin) and attracts until today pilgrims from all around the world. The monastery is also well-known for its boys choir “Escolania de Montserrat”. Visit the choir’s music school, founded in the 12th century the oldest in Europe, and, with a bit of luck, hear the choir perform its daily Salve Regina, before you head back to Barcelona. What is included in Montserrat tour? More Montserrat tours from Barcelona to come soon! Montserrat Spain is located 60 kms northwest of Barcelona. In car, it takes about 1 hour 15 minutes from city centre to the Monastery. Barcelona Montserrat can be reached by road but also by cable car or by the Ferrocarrils of the Generalitat de Catalunya, which bring you to the monastery. From there, you can reach the holy cave and San Juan by two funiculars. Several hiking trails have been laid out and provide access to other remains such as ancient hermitages, small churches or monuments scattered and often abandoned in the surrounding mountains. A dream for trekking. The Benedictine Abbey of Santa Maria de Montserrat is situated on the mountain range of Montserrat in Catalonia. A place of pilgrimage since the Middle Ages. Legend says that on a Saturday evening in the year 880, pastors saw a powerful light coming down from the sky along with a beautiful melody. Angels cutting the Montserrat massif with a gold saw to shelter the statue of the Virgin and the abbey. 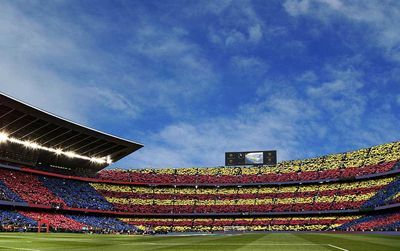 A vision that was repeated four times in a row, always on Saturday. After learning of the event, a bishop organized a climb to Montserrat during which a cave was discovered where an image of the Virgin was found. The bishop then proposed to transfer her to Manresa, but as soon as they tried to transfer her, she became so heavy that they could not move her. The man of the Church interpreted this fact as the will of the Blessed Virgin to remain in this place and decided to build a chapel on the site. From this legend also comes the popular etymology of the word Montserrat or "serrated mountain" in english, because the serrated silhouette of the massif evokes the toothed blade of a saw. Since this miraculous event, Montserrat monastery is considered a high place of both Spanish and Catalan Catholicism (Santa Maria de Montserrat is the Saint Patron of Catalonia), which is celebrated every 27 April. The Virgin of Montserrat, colloquially called Moreneta (black) for her dark colour, was carved in wood at the end of the 12th century. Today we visit at Montserrat: the Monastery, the Plaça de l'Abat Oliba, the Plaça de Santa Maria, the square in front of the basilica, the basilica, the Virgin's room, the Chapel of Our Lady, the Santa Cova and the Holy Cave. Information about Penedès wine and the famous Catalan Champagne: The Cava! The Penedès wine you will have the pleasure of tasting during your visit to Montserrat is a Spanish wine with a protected designation of origin (DO). Its vineyards, which lie between the Mediterranean Sea and the Montserrat massif, are located between Barcelona and Tarragona. Introduced by the Phocaeans, developed by the Romans who marketed it for its red grape varieties, it is finally to the monastic orders, mainly the Benedictines and the Cistercians, for whom wine is indispensable for the celebration of the Eucharist that we owe its journey in the centuries before arriving on our contemporary tables. The Penedés has been known since 1872 with the production of sparkling wines. Using the traditional method of Champagne, the region produces a wine called Cava. The commercial wine-growing development of the penedès is strongly linked to that of the cava. Today the winemaking and marketing operations are concentrated by cooperative wineries and private companies, the bodegas. Among the most famous bodegas we can quote: Torres, Codorniu and Oller del Mas that you will visit... Have a nice tasting! it takes half an our to get from Montserrat monastery to the winery. The tasting includes 3 wines and you will be able to buy wine at the end of the journey. Good to know that they take care of the shipping. How long does it take to get to the winery from Montserrat Monastery? How many wines are included in the tasting? Is it possible to buy some wine? Perfect day at Montserrat monastery, very moved to see the black virgin. Montserrat Mountain is just incredible spot to visit and just great for hikers as well.